When people talk about probiotics, you mainly think of people taking them orally via pill or eating them in yogurt in order to prevent yeast infections. But did you know that there are beneficial bacteria also living in your mouth that help to prevent cavities, plaque buildup and bad breath? "TheraBreath Multi Symptom Oral Care Probiotic is part of a new generation of probiotics that are very targeted in terms of their benefits. The BLIS probiotic strains used in this new TheraBreath product were discovered to be naturally occurring in the oral cavities of a very small percentage of children who showed a natural resistance to cavities, sore throats, ear aches and bad breath. BLIS strains selectively target hostile bacteria responsible for various oral cavity related illnesses while allowing beneficial oral flora to remain intact. This prevents compromising your body's natural immunity to disease, which can sometimes happen after antibiotic treatments." This stuff is so cool! First you brush with the TheraBreath toothpaste which is enclosed in the kit. Then, you mix the probiotic powder into a small amount of water (approx 2 mouthfuls), swish with one mouthful and then gargle with the other. It has a faint, very pleasant citrus taste. After that I use the TheraBreath mouth wash to finish up my routine. I started the week of probiotics with some severe stains on my front teeth, and I don't know if it's a result of using the probiotics, the TheraBreath toothpaste or just the fact that I'm being much better about brushing my teeth, but it seems as though the stains are slowly fading. Hopefully my new bacteria colonies will continue to flourish for the full month until it's time to begin my probiotic regimen again. (You only need to do this one week out of the month!) Hopefully the next time I go to the dentist he won't find any cavities. 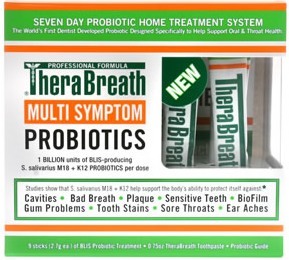 Cost: You can buy TheraBreath Multi Symptom Probiotics for $28 + shipping. Overall: We give TheraBreath Multi Symptom Probiotics a 9/10! 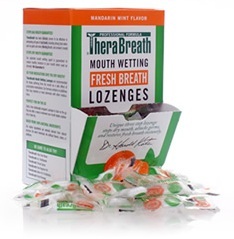 How would you like to win a box of TheraBreath Mouth Wetting Lozenges?!? We were sent a TheraBreath probiotics kit free of charge for the sole purpose of this review; no other compensation was received. All opinions expressed are my own. I've used their toothpaste and mouthwash before, but I've never tried the lozenges. I'd love to give them a try!